Plans have been unveiled for one of the world's first tidal power farms, to be sited off Anglesey. 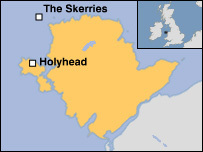 The project would see seven wave turbines placed two miles off the coast of the island in an area known as the Skerries. The scheme's backers, npower renewables and Marine Current Turbines (MCT), say it could provide enough energy to power 6,000 homes. Environmentalists Friends of the Earth Cymru have welcomed the development. The project would involve building the seven tidal stream turbines in 25m (82ft) deep water, two miles off the coast and around seven miles north of Holyhead. Each underwater turbine is capable of generating 1.5 megawatts of power using the powerful tidal streams in the area. If planning permission for the scheme is given the go-ahead, npower and MCT say they hope the tidal farm could be commissioned as early as 2011 or 2012. The managing director of npower renewables, Paul Cowling said he believed the Skerries project provided the perfect solution for exploring new green power technology. "Tidal stream may be a young technology, but we are convinced by the results of MCT's work to date, that this is a technology with the potential to make a valuable contribution to UK renewable energy supplies, and the battle against climate change." MCT and npower renewables have set up a new company to take the project forward, called SeaGen Wales. The Skerries site was chosen because of its natural shelter and strong currents, and its location close to the port of Holyhead. A full assessment and detailed surveys of the surrounding environment and tidal resources will get underway shortly and continue through the rest of 2008. SeaGen Wales said it hoped to be in a position to submit full planning applications in mid-2009, after local consultation. If permission is granted, construction could begin by 2011. Neil Crumpton, of Friends of the Earth Cymru, said the announcement was a boost for the search to harness greener power sources. "Britain has a great tidal stream resource along its coast. We need to develop these renewable energy resources - it can't be beat," he said. "We need to be moving on this type of technology, and it is nice to see that we are. "This is British technology and it will undoubtedly offer jobs for this part of Wales. Certainly in principle we would support it." However, the environmentalist admitted that the scheme would almost certainly have some visual impact, as each turbine rises 9m (30ft) out of the sea. "There will be a slight visual impact but what I would say is that we already have Wylfa nuclear power station on Anglesey," added Mr Crumpton.